I am currently offering an affiliate program for all of my e-books and my online course, The AIP Lecture Series. Affiliates earn 30% percent of the sales price for each sale referred through their unique affiliate links for my e-books and 10% for the online course. Join my affiliate program here! Once you’re all set up, if someone clicks on your affiliate link for my e-book(s) (whether embedded on your site as a hyperlink or image or shared through social media) and decides to make a purchase, you earn 30% of the sales price! Even if somebody decides not to buy right then, the affiliate link stores a cookie on their computer which lasts for 6 months so you can still earn a commission if they decide to buy the book in the future! Copy and graphics can be found in our Affiliates Folder. You are also welcome to use any images from my sales pages. However, no components of the e-books (including recipes, infographics, or any other page or element from the e-book) may be shared other than what is completely visible in the preview images on the sales pages. You are also welcome to create your own promotional images provided no copyrighted material from any e-book is shared. Please email [email protected] with any questions about what may and may not be shared. 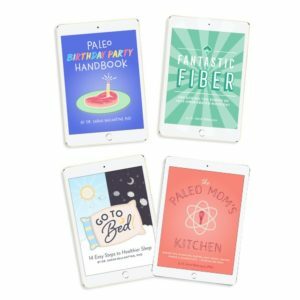 If you would like to be an affiliate for Paleo Principles, The Paleo Approach, The Paleo Approach Cookbook, and The Healing Kitchen the only mechanism for that currently is to join the Amazon Affiliates Program and the Barnes & Noble Affiliates Program.